UC’s new Vice Chancellor | Tumu Whakarae Professor Cheryl de la Rey and Chancellor | Tumu Kaunihera Sue McCormack presided over their first graduation in their new roles, assisted by Senior Management Team | Te Ohu Whakahaere, the Records, Examinations and Graduation team and academic staff. UC values the diversity on our campus and has over 100 nationalities represented amongst our students. 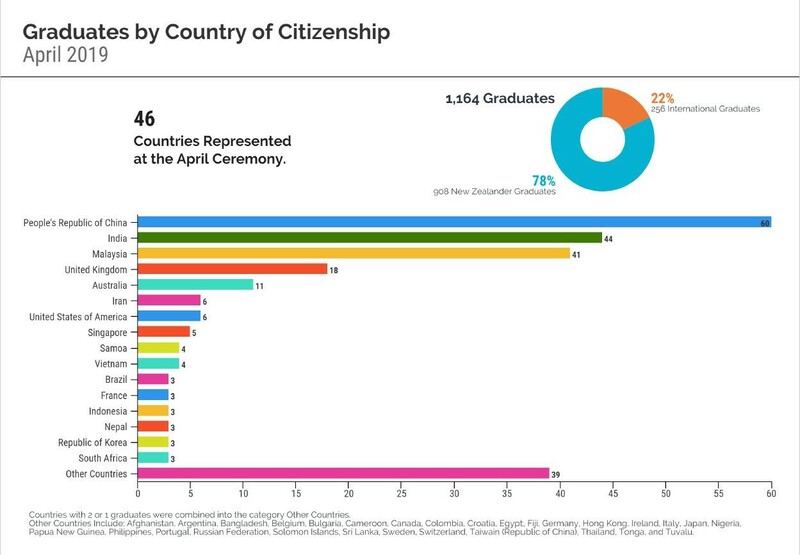 Students from 46 different countries graduated during this week’s ceremonies with the highest number of students coming from China, followed by India and Malaysia. 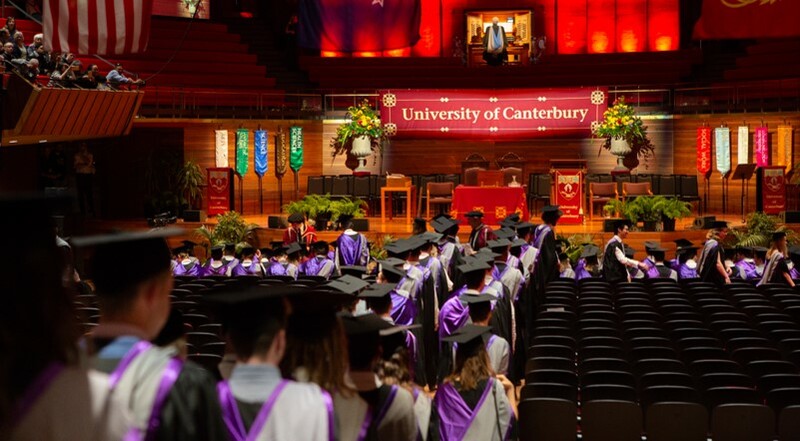 On Tuesday 16 April, the College of Engineering | Te Rāngai Pūkaha, College of Business and Law | Te Rāngai Umanga me te Ture, and College of Education, Health, and Human Development | Te Rāngai Ako me te Hauora celebrated 813 qualifications, awarded to 768 graduands. Almost 30 graduands received Doctoral Degrees, 139 received Masters Degrees and 92 graduands were international students. On Thursday 18 April the College of Arts | Te Rāngai Toi Tangata and College of Science | Te Rāngai Pūtaiao celebrated 341 graduands receiving 353 qualifications, including 21 Doctoral Degrees and 92 Masters Degrees. Of these, 35 graduands were international students and 11 graduands were Māori. There are seven Graduation Ceremonies held in Ōtautahi Christchurch each year, as well as one ceremony held in Rotorua for College of Education students based in the Te Ika a Maui North Island centres. End of year graduations will be held on 18 and 20 December 2019. The E tū, kia ora staff survey is due to close on Tuesday 30 April and we are preparing to move into the next consultation phase, a series of workshops to further discuss ideas. Due to overwhelming interest we have added additional workshops, both for specific groups and general members of our staff, based on demand. Workshops for all staff will take place on 10 May, 29 May and 7 June; while workshops for specific staff groups will take place from 6 May until mid-July. If you would like to attend a session please register your interest as soon as possible on Eventbrite. The registration process is easy, simply select your desired session and enter your details. 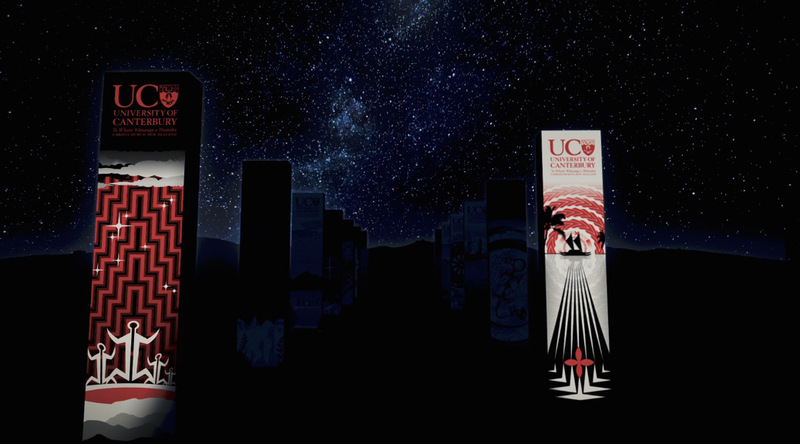 This is your opportunity to have a say in the future of UC. If you are unable to attend a workshop, we hope you will follow the process on Intercom | Pā mai tō reo and engage with the online discussion. Join us in celebrating the very substantive contribution to academia made by Professor Annie Potts and Professor Michael Plank in the next presentation of our Professorial Lecture Series for 2019. 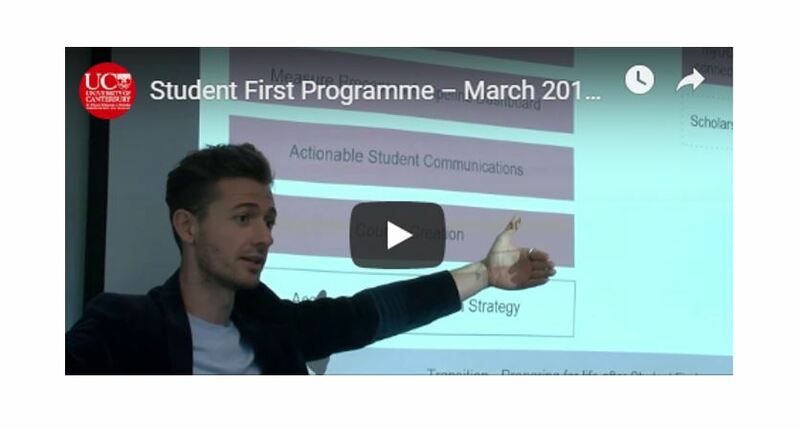 Date: Thursday 2 May, from 4.30 – 6.00 p.m.
All staff and postgraduate students are encouraged to attend the lecture series to actively support our new Professors, and take the opportunity to appreciate the fantastic research being undertaken in parts of the University you may be less familiar with. You’ll find further information on each presentation, below. For students and researchers of human-animal relationships, the words ‘vegan’ and ‘veganism’ have begun to function not only as the descriptors of a practice – a way of living and being in the world – but also as critical terms. In this regard we can say that ‘vegan’ and ‘veganism’ refer to a particular kind of conceptual approach, one characterised by an ethical and political commitment to the identification, analysis and rejection – as far as possible – of the ideologies that justify and enable the exploitation of nonhuman animals. In addition veganism, both as a practice and a critical method, increasingly tends to combine with ‘intersectional’ forms of thinking, which aim to recognize the ways in which human-animal relations are intricately linked with the politics of race and ethnicity, gender and sexuality, class, and physical ability and disability. This presentation will introduce key theories of veganism, placing particular emphasis on new critical thinking emerging from Intersectional Vegan Studies. Special attention will also be paid to representations of meat and its consumption (as well as meat and dairy refusal and veganism) – phenomena that should be central to any thoroughgoing understanding of food futures, both in Aotearoa New Zealand and around the world. Many species of fish begin life as tiny larvae and grow to be several million times larger as adults. Over the course of its lifetime, a fish’s predators and prey change drastically as it grows bigger. This means that body size is a crucial variable in any population. Size-spectrum models are a type of mathematical model that calculate changes in body size as a results of biomass being transferred from prey to predator, and from parent to offspring. This is a different paradigm from a classical species-based predator-prey model. In this talk, I will give an overview of how size-spectrum models work and the insights they have given into marine ecosystem dynamics. I will show how these models can be used to investigate the ecosystem-level effects of different approaches of fishing, such as different size-based fishing regulations. This includes short-term considerations such as sustainable yield and effects on ecosystem structure, as well as longer-term change such as fisheries-induced evolution. From this week you will see concrete bollards placed around the centre of campus. This is in preparation for the UCSA Anzac Day service on 25 April. Placement of the bollards will restrict and reduce the level of vehicle movements in the heart of campus making it a more pedestrian-friendly area. If you skateboard, cycle or scooter around campus please take care around the new barriers, reduce your speed and be considerate of pedestrians and each other. Bollards will be placed on access footpaths into Matariki Quad and at both ends of the path that runs between C Block and Undercroft. The First Nations’ Futures Programme provides an unique opportunity for aspiring Ngāi Tahu leaders and other Māori postgraduate students to gain access to leading international research and thinking within a specifically indigenous context. 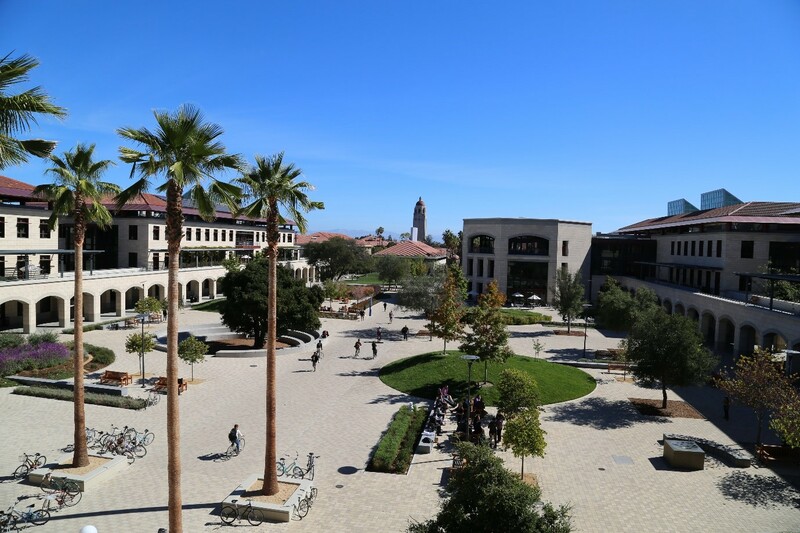 The First Nations’ Futures Programme is held at Stanford University for two weeks in October/November. Applications are also invited from Ngāi Tahu and other Māori undergraduate students who are close to completion of their degree and who intend to apply for postgraduate study in 2019-2020. The closing date for expressions of interest is 31 May, 2019.